Try these 5 tips to improve balance on your mountain bike. Some people have great balance. Others struggle. These five tips from Jeff Lenosky will help you anytime you need to ride a precise straight line. 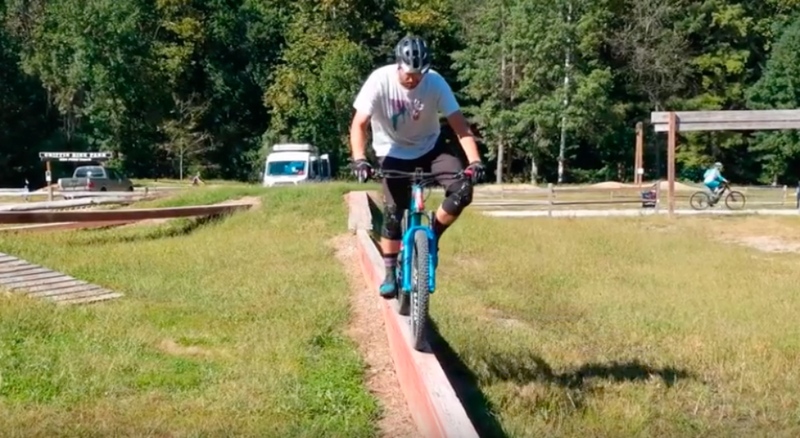 Press play to learn how to improve balance on your mountain bike. 1. Look where you want to go and not where you don’t want to go. Do this and your bike and body will follow. 2. Drop your hips. Getting your center of gravity even a couple inches lower will dramatically improve your balance. If you have a dropper post try dropping your saddle a little when riding skinnies or technical trail sections. 3. Drop one pedal so that more of your weight is below your axles. Expect that you’ll need to practice this a little because when you drop your pedal it’s going to counter balance your bike and you are going to need to lean your bike a tiny bit to counteract that. 4. Don’t look straight down at your tire, which when riding something really skinny is the natural tendency. Instead look a little ways out in front of you and this will help improve your balance. How far out in front of you will be relative to how fast you are riding. 5. Experiment with your brakes. You can really improve your balance by doing adjustments with your brakes. If you are riding on a narrow feature and you start to get off balance, slightly drag your brake to slow your bike down. This will give your body the chance to catch up and adjust by making a weight shift to get back on track. Have any tips to add? Let us know in the comments section below. And be sure to check out more videos on Mtbr.